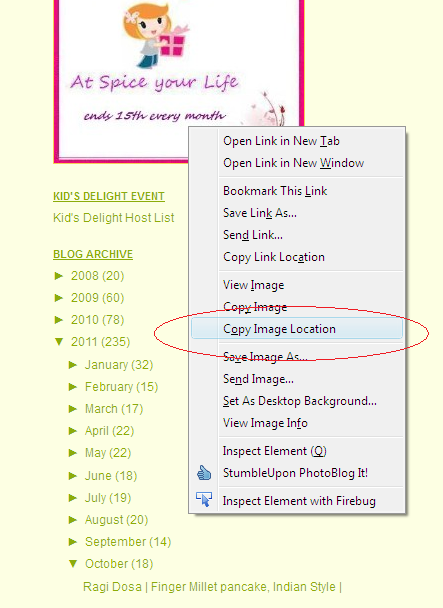 This post will explain how to create Hyperlink in your posts. Though creating Text links is a general concept in a website, I will be talking more in terms of a food blog. Knowing basic HTML codes is very essential when you are maintaining a blog. Especially if you are a food blogger and you want to participate in the many different food blog events that happen every month. There are two ways we can create links. 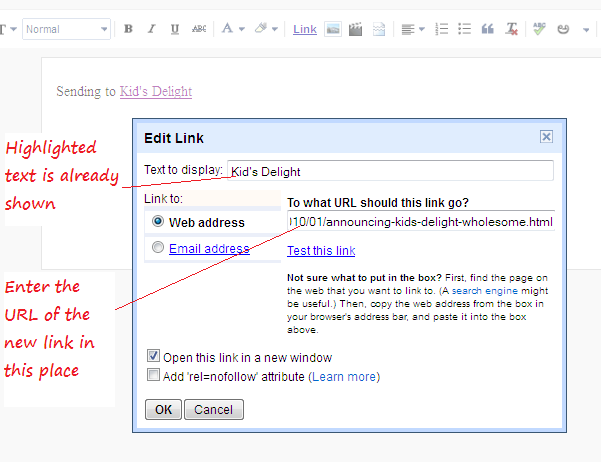 In Text Links, you simply highlight a text and click on the Link button available on your editor. Give the details and save the setting. 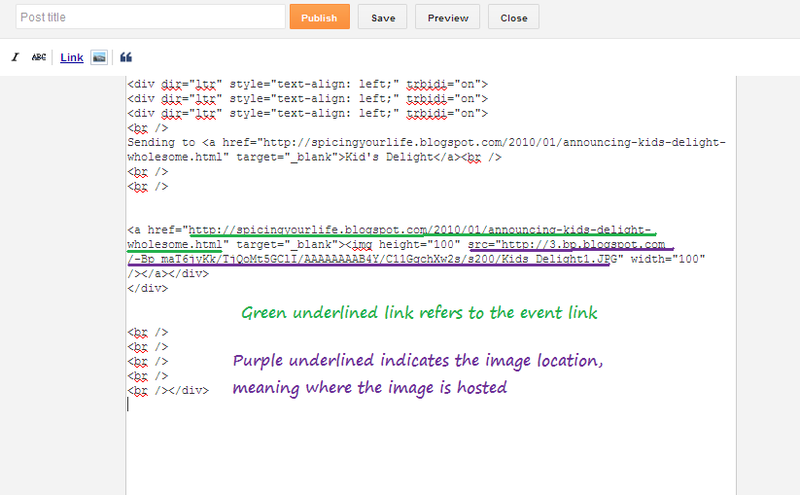 Images Links are little more complicated wherein you will have to go to the HTML part of your editor and give the code. In image links, the images used, will have to be hosted in a server. For hosting you can use Google Picasa, other third party hosting websites like Photobucket etc. After hosting the image, you will have to give the Image location in the code that you will be placing. In your compose, type in the text you want to be a linkable text, in other words if we are talking about Food blog events, enter the event name, highlight the name. Click on the LINK button on your editor. 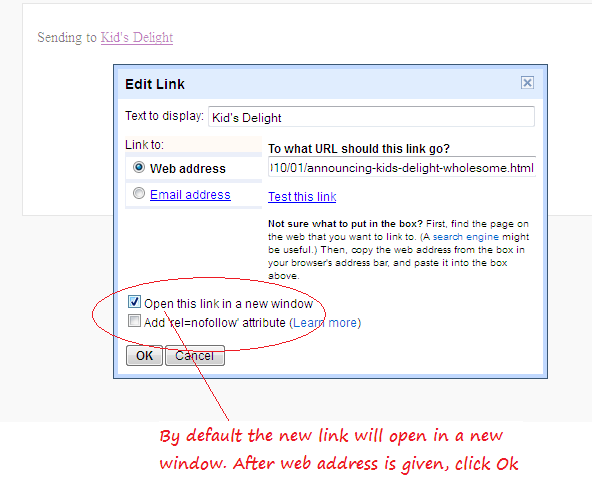 Next give the URL of the link which you want to create. You can go to the host website and get the Image details. Remove the spaces before using the code..
You will see the event logo as below. You can click on the image which will take you to the URL directly. Hi, thank you for sharing this Very informative posting. Really appreciate your effort. Valli thanks..this takes me back when I had just started blogging..u came in to rescue…remember?..I had no clue how to hyperlink!..as yet I am unaware of lot of things..its because of u friends I am here today.THANKS A MILLION TON! Wonderful, i had hard time with this text link and image link issue, some of the few bloggers helped me in my earlier blogging..Definitely helpful for many new comers. Thanks dear. This is most useful. Bookmaking this for when it comes to using this I will have forgotten where I read and what? My image link is opening in the same tab but I want to open it in a new tab. How can I do that ?